My company's CNY dinner was definitely an eye-opener. Maybe cuz back in my YHS days, we didn't have the privilege to organise extravagant dinners in conjunction with any celebration - CNY dinners, annual dinners etc. Hence, joining one of my company's usual dinners & witnessing such grandeur seemed overwhelming. Our theme for the night was "Shanghai Night" which means everyone was expected to don a piece of traditional Chinese clothing, be it cheongsam, qipao or samfu. 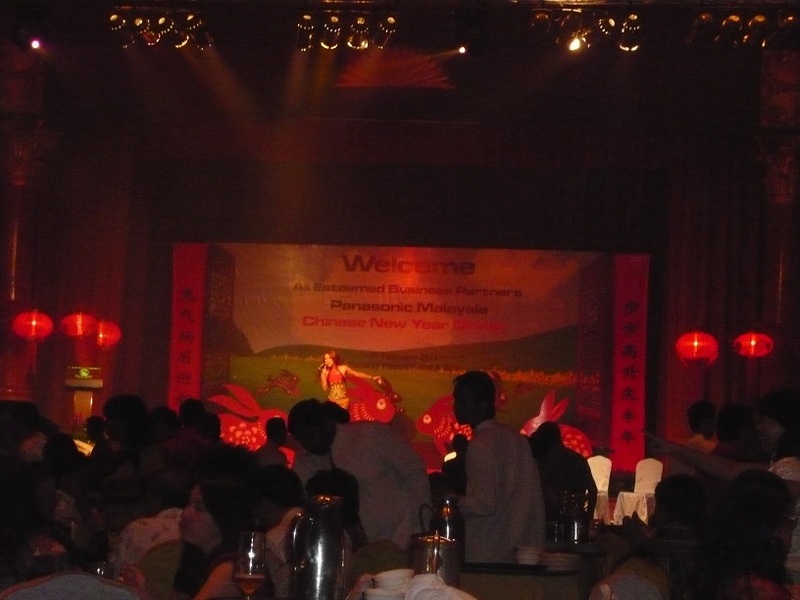 The dinner was held at the Grand Ballroom, Sunway Resort Hotel & Spa. 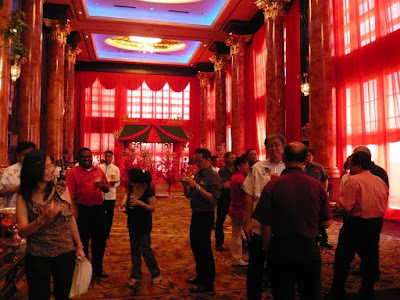 Decorations just outside the ballroom was captivating with cherry blossom trees & a mini pavilion at one corner. I was expecting the dinner to start off with a lion dance opening ceremony - a typical auspicious gesture for good wealth among businesses with employees & business partners of Chinese majority. 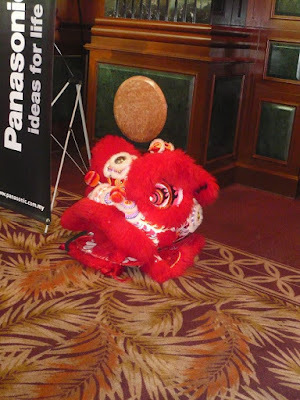 Spotted is a lion dance masthead seated nicely while the troupe waited for all the VIPs to arrive. 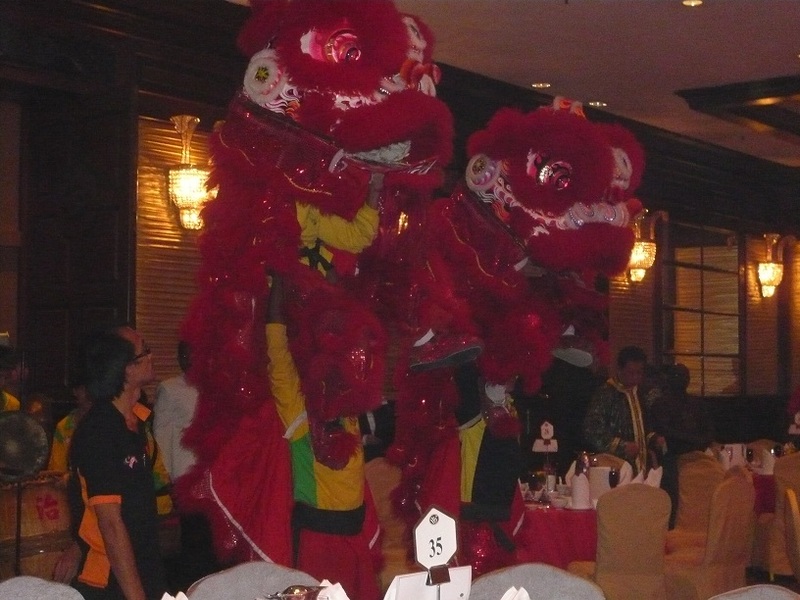 The lion dance got into action as soon as the guests filled up the ballroom. The dinner consist 8-course dishes served halal with a mass yee sang tossing among 53 tables of employees, agencies, suppliers & dealers alike. The variety of performances were limited to the Chinese orchestra & a special performance by one of the Miss Malaysia contestants (I think).